Students gain hands on learning through undergraduate research. The Office of Undergraduate Research is excited to launch a new opportunity for the 2019-20 academic year. First Year Research Experience allows students to use their federal work study funds in a research or creative activities job, enabling students to get paid to learn. 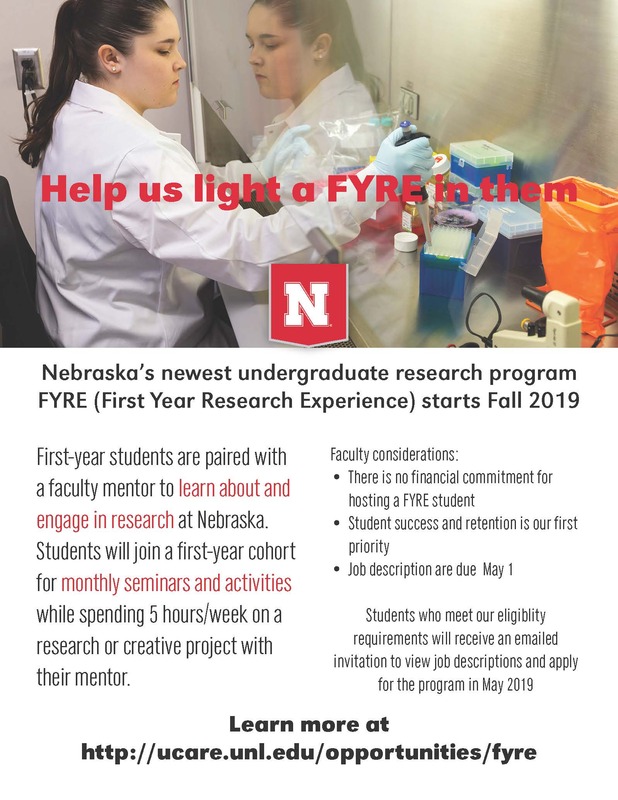 FYRE will match interested first year students with faculty mentors to learn about research and creative activity in the mentor’s field by spending five hours a week on a manageable project over the course of the year. We are seeking faculty mentors who are committed to student success through high-impact learning practices like undergraduate research and are interested in developing projects and opportunities for freshmen. Job descriptions from interested faculty mentors for the 2019-20 academic year are due May 1. Learn more about the program and how to submit your job description on the UCARE website . Please contact Justina Clark at jclark17@unl.edu or 402-472-6023 for more information.